Quick little tip for all my fellow coffee shop, shared-desk, or kitchen-table-coworking colleagues. If, like me, you don’t have an office or desk to call your own, it can be a little disorienting and discomforting to unpack and re-pack all your stuff at the beginning and end of each work day. It’s hard for me to feel like wherever I’m working is truly “mine,” and that can make it hard to get into a groove. One thing that works for me is bringing a few small crystals in my bag each day and placing them next to my laptop wherever I’m set up for the day. They don’t take up much space nor add much weight to my bag. Beyond whatever properties you do or don’t believe the stones themselves to possess, they give wherever I’m set up a sense of home, and that is huge to me when I’m moving around throughout the week. 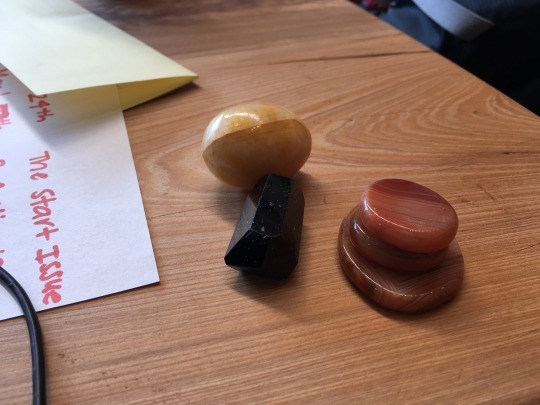 If you’re curious, I’ve got black dravite (to accept all facets of myself), a little stack of carnelian (for courage and prosperity), and my solar plexus egg which I don’t even know what it’s made out of. Also, that handwriting is way too clean to be mine! If you’re not into crystals, you could bring any sort of totem, talisman, good luck charm, or tchotchke with you. I happen to like my stones think gem stores make great artist dates 🙂 If you don’t, play around and find what works for you!